Quickly and safely slice food without the messy cleanup. 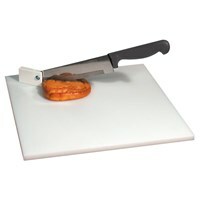 This safety cutter is the revolutionary 2-in-1 knife and cutting board that chops and slices your favorite foods in seconds! The secret is the clever design with ergonomic power pressure handle. Effortlessly cut through food fast! Sharp premium blade and the extra wide mouth makes cutting fruits, veggies, meats and more fast, easy and mess-free. Opens wide for cutting larger foods. Ergonomic grip is comfortable to use and the locking safety hinge safely keeps it closed. Space-saving-- no need for an extra cutting board! Mount to any knife block or store in your kitchen drawer. Stainless steel blade can be hand-washed or put in the dishwasher. 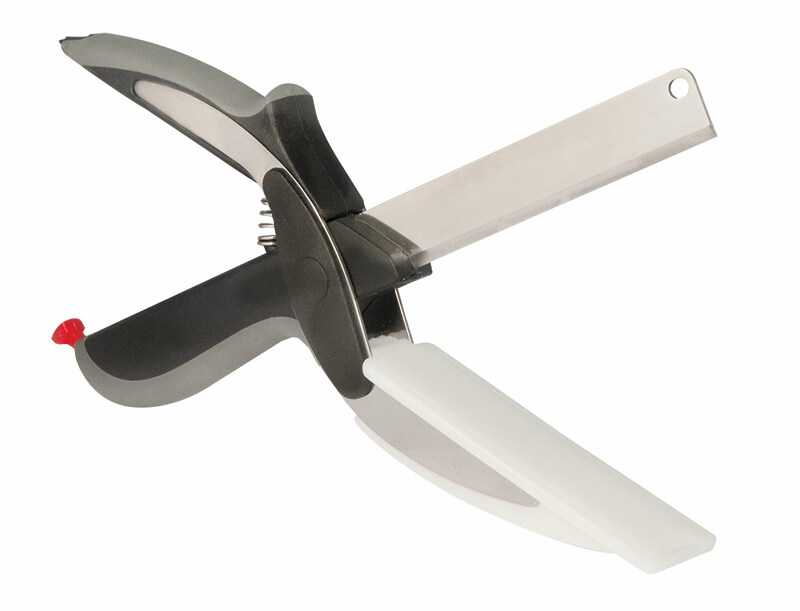 Knife detaches for using separately. Measures 10 inches long.